At some point, during the collegiate career, students are likely to be required to make an academic presentation for different class projects. If you are given this task, your ultimate goal is to deliver certain information to your audience in an exciting way to grab their attention. You need to do your best to make a great impact on your audience and ensure that they will retain all the information you presented to them. That is not easy, and it goes without saying that a good PowerPoint presentation can’t be created in a few minutes. Need some advice on how to make your presentation unique and engage your audience? Keep reading this article to learn some effective techniques for preparing and delivering cool presentations in a college or grad school. You will also find here some interesting presentation topic ideas for your inspiration. What Is an Academic Presentation? A presentation is actually any situation when you have to deliver an informative or persuasive speech in front of people in order to share some information or educate them. In order to present information in a more powerful way, presentations are typically enhanced with different audio-visual aids like flip charts, slides, short videos, music, audio recordings, etc. ☑ to persuade that is to make your audience take action that you want (in this case, you should use some logical appeal to the emotions of your audience). When you prepare an academic or business presentation, you should keep in mind, that it is not a talk or a lecture on a specific topic. If you don’t want your audience to be bored to death, you need to make your presentations interactive. Wondering how you can do that? You should be ready to engage your participants and have a flexible attitude. You should use various materials that can engage multiple senses of your audience. For example, you can consider adding videos or using music so that your audience can have fun. round-table presentation when several short talks on a particular topic are held. Before we start discussing how to make an effective presentation, have a look at the list of amazing presentation ideas that will help you get on the right track. Don’t be afraid to express how you feel even if you are speaking in front of a crowd. You can watch TED talk by Tom Stranger and Thordis Elva who speak about their personal experience of having a teenager romance. We can hear how their voices crack and break. We can understand their pain because they sound so authentic and generate compassion in their audience. Follow the example of the former US President, Bill Clinton, who can get the Oscar when it comes to improvisation. When he was making his first State of the Union address, he improvised 20% of his prepared speech, ignoring a teleprompter. He relied on the common sense and delivered a winning speech. Rehearsed presentations can go smoothly, but they never make history. Don’t be afraid to improvise! Wondering how to keep the audience’s attention? Keep moving around and gesturing because typically, people tend to pay more attention to objects that are moving. Steve Jobs used this technique when announcing the first iPhone in 2007. When delivering your presentation, don’t stand still. Step down into your audience and walk using gestures to emphasize your points. Non-verbal communication is really very engaging. Storytelling always resonates with any audience. It’s a great way to make connections because telling personal stories is the fastest way to build trust. Jacob Barnett, a child prodigy, who was diagnosed with autism, shares a story about his journey from outcast to prodigy, showing that he is a human and stirring emotion. When it comes to a powerful presentation that can help you stand out and bring you an A, choosing an interesting topic can be a key to success. Here is a short list of cool presentation ideas that you can use. Pick up a perfect topic if you don’t know what to speak about . The Earth without Humans: What Will It Look Like? Does Social Media Make People Stupid? In fact, modern technology has the power to make any presentation emotional, funny, exciting, and memorable. Any modern computer comes already equipped with some video and audio editing software. Additionally, you can find a lot of cheap or even free options available online to download. You need to be creative and use advanced tools to communicate your message through images, sounds, and body language. Make your presentations interactive. ★ With Animoto.com, you can create videos with pictures, text, and music. ★ Easel.ly and Visual.ly are great tools for creating infographics. ★ Wordle.net is a tool for generating “word clouds” from texts that you paste or type. ★ Sony Vegas, Adobe Premiere, and Apple Final Cut are video editing programs that can help you make videos look professional. ★ Audacity is an open-source audio editor that will help you present great audio clips to your audience. It’s important that audio and video editing software has export options so that you can upload the edited files to any of the files sharing websites like SoundCloud, Google Drive, Dropbox, YouTube, etc. You can easily access your files during the presentation. You can use the embed function in Keynote, PowerPoint, Prezi, Google Slides to include your audiovisual files directly into your presentation and integrate them into your talk. Audiovisual elements can serve as examples, evidence, attention grabbers or memorable takeaways to your listeners and can keep them engaged. suitable audio and visual means of the presentation. Do you find these requirements too tricky? 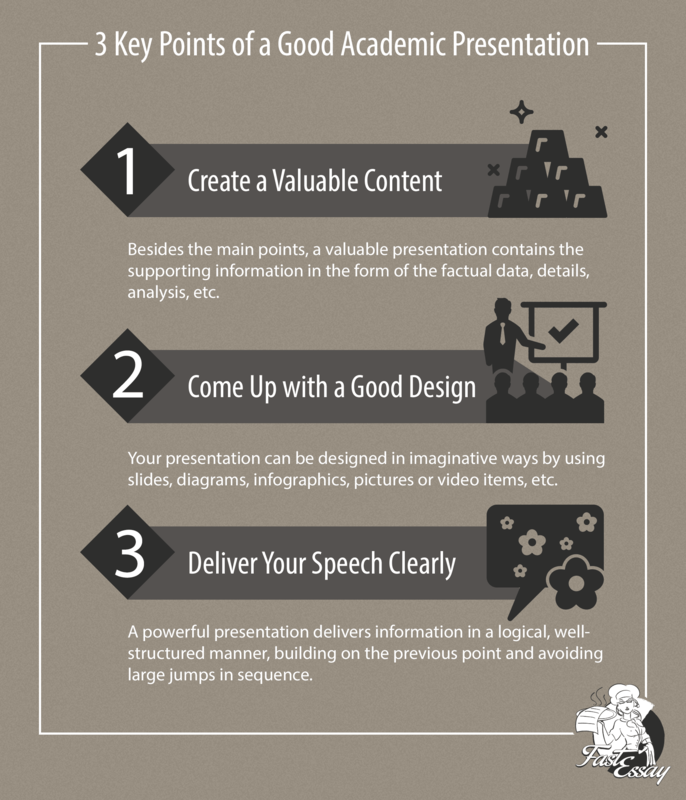 Creating a good presentation is one of the multiple academic skills you have to master in a college. You know very well that you can learn any skill if you work hard and practice a lot. For example, if you can’t boast of being a strong writer, you will eventually learn to write any type of essay if you practice writing on a regular basis. The same is with academic presentations. You can learn how to create them and continually improve your skills through practice. Remember that good presentation skills can help you achieve success in your professional life. ✏ Content. 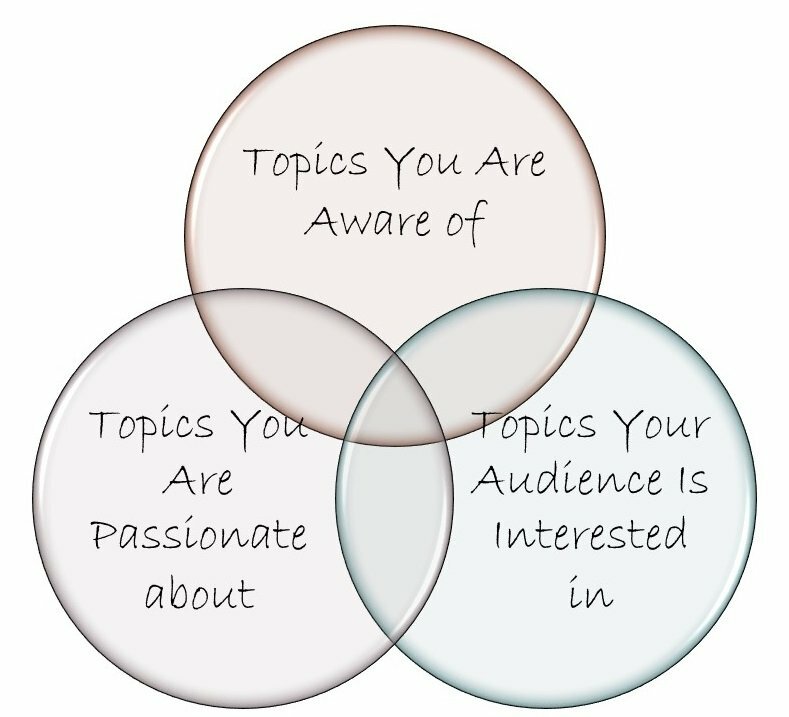 You should do some research and structure your thoughts before you share them with your audience. That’s why you have to understand what message you are willing to communicate and why you are going to do it. Careful planning of your presentation is a must in the study guide. ✍ Design. Practically all presentations today are accompanied by infographics or PowerPoint slides. So, you should learn to design slides, make graphs, charts, diagrams, infographics, etc. Try to make strong visuals that are simple, straight, and easy to follow. You should present all the information in small chunks. ✅ Delivery. You should learn to deliver your message to the audience in a convincing way. To ensure that your presentation goes smoothly, you should practice delivering it. A good idea is to learn some impressive techniques from public speaking in order to make a connection with the audience. You should speak loudly and slowly to help your audience follow your talk. Keep your presentations short. 20 minutes will be enough because it’s difficult to keep people focused longer than that time. If your presentation is long, you should encourage your audience to participate by asking questions, offering quizzes, etc. Keep your presentation simple. You should resist the temptation to use all animation features that are available in the majority of presentation software. These features can be a distraction to your audience. You’d better add one or two simple features. Limit text in your slides and use short titles. In some cases, you don’t need any text at all. Use pictures, great graphics, and professional diagrams because images are worthy of thousand words. Don’t use more than 3 bullets on every slide. If you include a lot of text, your audience may feel overwhelmed. The listeners will try to read every tiny word on your slide instead of listening to you. Don’t read the slides you have created. They can cover basic key facts. Expand the information written on your slides by providing additional examples and details that your audience may not know. Make eye contact with your listeners during the presentation and don’t forget to smile. Involve your audience. Prepare different contests and quizzes based on your topic or ask them relevant questions. You can also ask your audience to share their personal experience with your topic. Use handouts with the key evidence and definitions of important terms. Then, there will be no need to spend your precious time on describing the evidence. You will be able to concentrate on data analysis. Always stick to the time limit. Practice your speech enough to understand how much material you can cover during the given time. By now, you have more chances to get well-prepared for a college presentation. Just follow everything mentioned in our article.